Ziox Mobiles, a new entrant in the Indian smartphone market has launched another smartphone in country. The Ziox Astra Force 4G is a run-off-the-mill entry-level smartphone with features that shall appease the first time smartphone user. The Ziox Astra Force 4G starts off strong with a 5inch display with FWVGA resolution that is shrouded in DragonTrail glass. Normally most smartphones in this range do not have protective glass but the Ziox Astra Force 4G does. 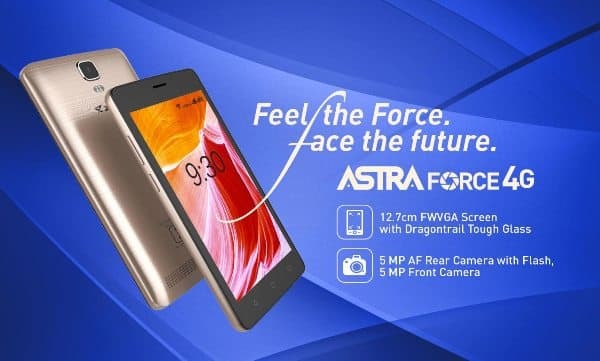 The Ziox Astra Force 4G does not mention the chipset that is used but we know from the product page that it has a 1.3GHz quad-core processor and 1GB of RAM. The Ziox Astra Force 4G comes with 16GB of internal memory and a microSD card slot that can accept cards of up to 32GB. The Ziox Astra Force 4G is also one of the cheaper smartphones to supports OTG which means you can use a thumb drive with the help of a cable that is sadly not sold with the smartphone. The Ziox Astra Force 4G has a 5MP LED camera with flash on the rear and a 5MP camera on the front. The Ziox Astra Force 4G is powered by a 3000mAh battery that can last for more than a day on a full charge. The Ziox Astra Force 4G supports Wi-Fi, microUSB and Bluetooth connectivity. The Ziox Astra Force 4G does not sound like a better deal than the Redmi 4A which is incidentally cheaper than the former.